Here'a little eye candy...photos from my first Breakfast Club of the "summer." I neglected to get the names of the patterns so if you are interested in one, you will have to leave a comment and I will track it down. First up...a look at the pattern from the March meeting. Three ladies had their's for show and tell. Check out how they all started with the same center panels and background. And Rona's version...love all those borders. Projects from previous BC meetings. Jackie's strip quilt. I think I made this last summer without borders...I like the borders on this one very much! Looks like a one-block wonder from Rona. Hard to see the cool little details in her lighter blue border in this photo. A nice touch. I think I am a "border person." This is such a sweet little wool quilt. Jackie picked it up (the cut pieces) at a garage sale. These are all her own designs. I think she's a natural when it comes to this quilting business. Kathy took on putting together all the projects she had piled on her sewing table...lots of calendar wall hangings. And a few lap-sized quilts, too! This one uses fat quarters. This is the project for April's BC. Most of the ladies who bought this kit got it done or pretty darn close to being done in our meeting time. This was Rona's version of the pattern...extremely cool! I want to make this now! I'll have to check my Alaska animal stash of fabric. I forgot to buy the pattern...it is very simple but always nice to have someone else figure out the math. This is May's BC project...a design using fat quarters. And I have one more fun photo. These were my table companions, Marilyn and Erin. Erin had just acquired a new-to-her Bernina which was the same model Marilyn had...and they just happened to have coordinating light turquoise tops! It was such fun to see everyone again plus meet some new faces. If I changed my blog to home improvement topics I would have a more regular blog posting schedule. This week I have been tackling re-caulking tile joints. Doesn't this corner look nice on my bathroom counter? It's getting out the bad caulk that is the time consuming part of the process. The really sweet news is I have a bed to sleep on! The furniture saga is almost to an end. The bed frame was delivered last November...the day before I left for Paris and I was still in need of a new mattress set. Finally got that picked out and it was delivered yesterday. (Since getting back to Alaska I've been sleeping on a twin-sized mattress snatched from a bunk bed, thrown on my bedroom floor.) Love the new bed! In case you are wondering about the quilt it is, "Strip Churn," a Cozy Quilt design from the book, "More Strip Clubbing." It's one of my favorite quilts! Very fast quilt pattern to put together. ...perfect timing for me as I work to design our landscaping. I think it is a great book! I won't get anything planted in the ground this year but I do hope to get started on my "hardscapes." I did a little work last week with my hands that involved fabric and thread. I went to Breakfast Club on Thursday (more photos in a later post of show-and-tell...it was so awesome...can't wait to share it with you.) I started another Batiki Argyle quilt. Finished another Santa cross stitch ornament. And I pulled out a UFO to hand-quilt that has been hidden for four or more years. I have made many of this designer's "Bear" stockings. (Jodi Warner of Hearthsewn patterns) I love her patterns...there is a little of everything in her designs...paper piecing, applique, patchwork and hand-quilting. It usually takes me just two hours to hand-quilt one of these so I'm not sure why it had to "age" in box for so many years! I'm linking up with Kathy's Quilts, where she hosts a Sunday gathering of hand-stitching show-and-tell. I'm so glad she hosts this party...it has motivated me to work on this stocking. I am so happy to be posting a Design Wall Monday from my Alaska sewing room with fabulous lighting. The colors of the fabrics looks so much better! I've got a deadline to press me into action...I am meeting with the Breakfast Club on Thursday. So...my goal is to get the borders on my Bear Ridge quilt. The black batik looks pretty good for the borders. . I have been planning new quilts. I hope to start this one at Breakfast Club...another Batiki Argyle. And another...I'm still pulling fabrics from my stash for this one. One day, I'm at an exhibit in Paris of fine jewelry from Cartier. The next day, my jaw is dropping down in awe as I look at all the displays on exhibit in Cabela's. That's a real airplane in the store! We picked up some ammo for me...as in gun ammunition. There's something I never really expected to say! I am enrolled in a women's gun course in August. I decided it was time for me to learn how to shoot all the guns we have in our house. They don't really work as effectively as a club. I've always had big dogs to protect me but now I don't and I am too far away from the police to rely on a 911 call if a bear decides to visit me in an up-close and personal way. I also wanted to share my pretty birthday present from my mother-in-law...yep...I had one those pesky birthdays...while we were in Madrid and I was not feeling so great. It was a nice treat when I got to Alaska and had this little package waiting for me...a little travel purse for my jewelry. It opens up to a very smart storage setup on the inside. I like the leather piece with punched holes for earring storage. Thank you Mimi! I have been trying to at least spend an hour or two in my sewing studio at night, after all the chores are done. 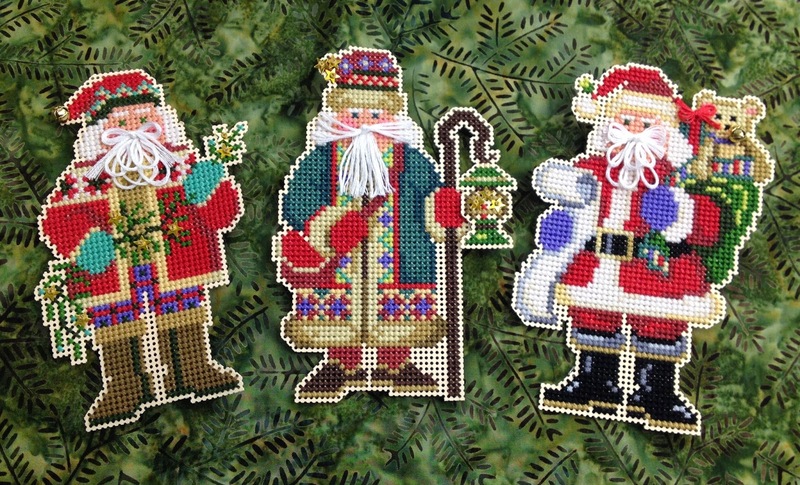 I finished up the beards on three santas I cross stitched over the last month of traveling. I gathered all the cross stitched ornaments I finished in the past year that now need to be backed with wool felt. One of these years I will be able to spend Christmas in our home in Alaska and have a huge tree on which I will be able to hang all my ornaments. I counted in my Needlework Journal how many cross stitch projects I have completed...say in the last 15 years. Any guesses? 123! Mostly ornaments but also a few small pictures. I am on the last sanding and coating of polyurethane on the two large shelving units. I have really been trying to get those pieces done so they can be installed for a "built-in" look. Then the interior of the house is mostly to that wonderful "decorating" stage. 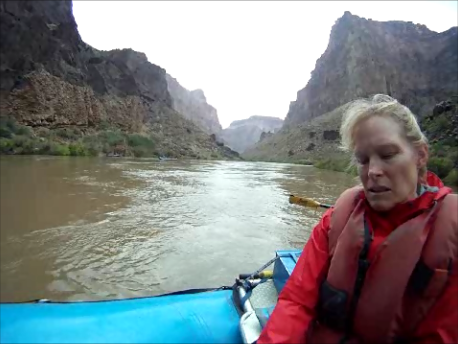 Several years ago I was TRICKED into participating on a 12-day rafting trip on the Colorado River through the Grand Canyon. It was a private trip...no tour guides...no helper-bees to do the chores. It was exhausting. It was SCARY almost every minute of the day. There were three other families in our group. Each family had a raft...one of the rafts flipped on the trip. On another day...we got caught in a small canyon by a flash flood. More than once...it was LIFE-THREATENING SCARY! I blogged about it and all my entries about the trip were titled, "Into the Raging Water." On that trip, I said I was taking charge and planning the vacation I wanted. I am another step closer. I have bought non-refundable airline tickets. May 22nd I will begin my adventure. I've been creating...but not in the quilting world. 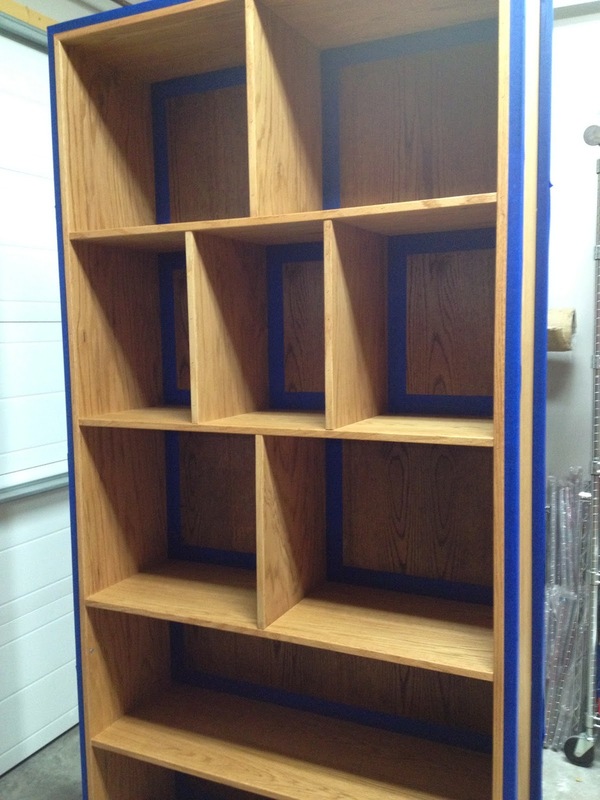 I have two shelf units I am staining. I also stained three large planters that will go outside on the front of my house. I still need to add slate tiles in the mesh area. This is as close as I have gotten to quilting...opening the boxes of fabric I ordered while in Paris. And a block from McKenna Ryan's, "Dog Park." I ordered it from Batiks Plus...one of my favorite internet quilt shops. The kit came in a nice box. Batiks Plus always uses the exact fabrics the designer has specified and everything is meticulously labeled. Then there are all those appointments I have to do...check ups with doctors and most importantly...getting my hair done. And the other time-consumer is cooking. I have made dinner for my sons at least half of the nights that I have been home. One of these days I am going to make it to my studio. Unlike many parts of the lower 48, Alaska had one of it's mildest winters! There is very little snow on the ground for early April. This bodes well for my summer landscaping plans. My first stop on day one in Alaska was to see my doctor and get some antibiotics. They are working...I feel so much better. 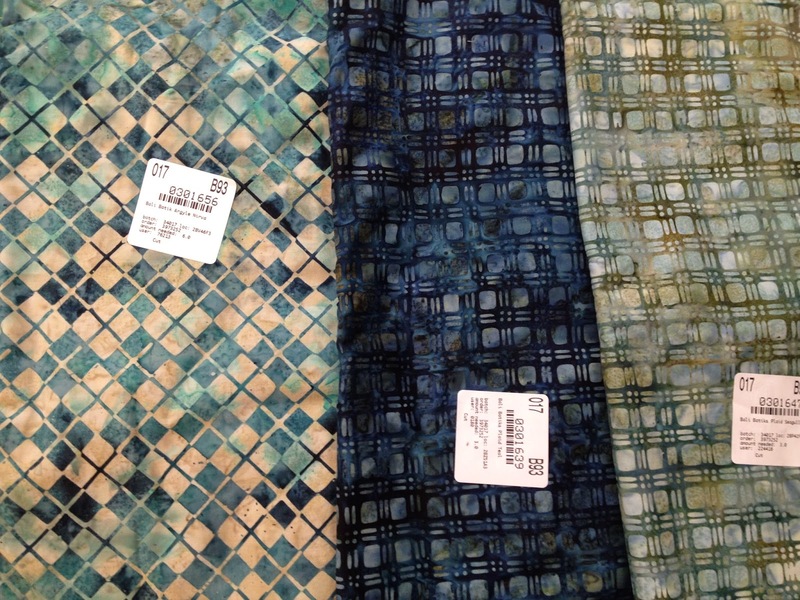 While I was waiting for my prescription to be filled, I jaunted over to the quilt shop where I originally bought the black dotted batik that I ran out of in Paris. No luck finding that fabric but oddly enough, the shop had the backup color I planned to use, a Hoffman 1895 batik, Black Light. All the fabric was on sale...25% off! I got it for $8 a yard. I think it will work out just fine. My travel plans for Bali are underway...I think it is really going to happen!